Straughan Photography was delighted to be chosen as the photographer for the wedding of Claire and Michael on Saturday, March 9th, 2011. 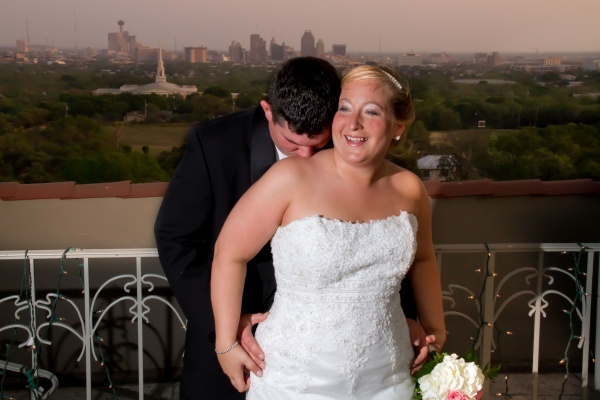 All of Claire’s wedding day dreams came true at the beautiful Bushnell, just outside downtown San Antonio. The couple had an intimate, yet elegant, wedding at the Christ Episcopal Church followed by an outdoor cocktail hour on the Bushnell rooftop with a grand reception in the Bushnell’s downstairs ballroom. The ballroom was decorated in light sage and white linens with multi size pink and white carnation balls on tall vases. The charm of the Bushnell enchanted guests as they came up the 1930s style elevator and stepped into the elegance of this classic event. At the end of the evening they left through a veil of bubbles, hugs and kisses. The bride & groom are so in love! Congratulations Claire and Michael and thank you for letting Straughan Photography participate in your special day!